Its one place where they put all eggs in one ‘basket’ – your plate. We went to this place many years back when we got to know that they serve Eggs Benedict. Loved it then & somehow never managed to get back again. 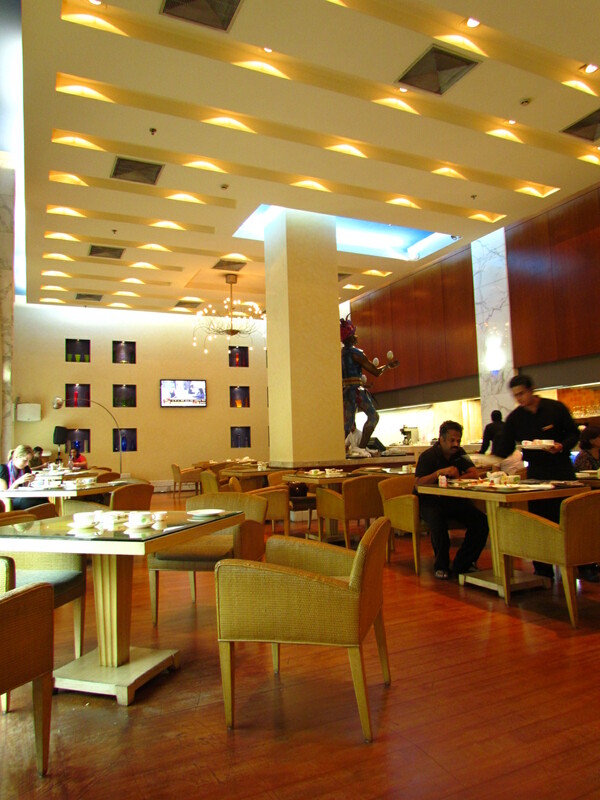 The Restaurant serves as the Coffee Shop of the Vasant Continental Hotel. However Eggspectation is a Canadian Chain Restaurant that started in 1991 that crossed the border & forayed into the US & of course came all the way to India as well. The theme as u can guess by this time is eggs & there are many innovative & unusual dishes around eggs with equally interesting names like eggkuri, eggchiladas, eggstravaganza, an omelette called eggspectation & so on. Of course, for people who are not too fond of eggs, there r dishes without eggs too. The service was good last time when I went at around 11.00 am. This time we were there at 9.00 am & it was peak hours for breakfast buffet for the guests of the hotel. It seems that is the reason why the staff were less attentive & slow in executing the orders. They did not positively contribute to the breakfast experience at all. The ambience was nice with two prominent huge figurines of clowns – one male & the other female. 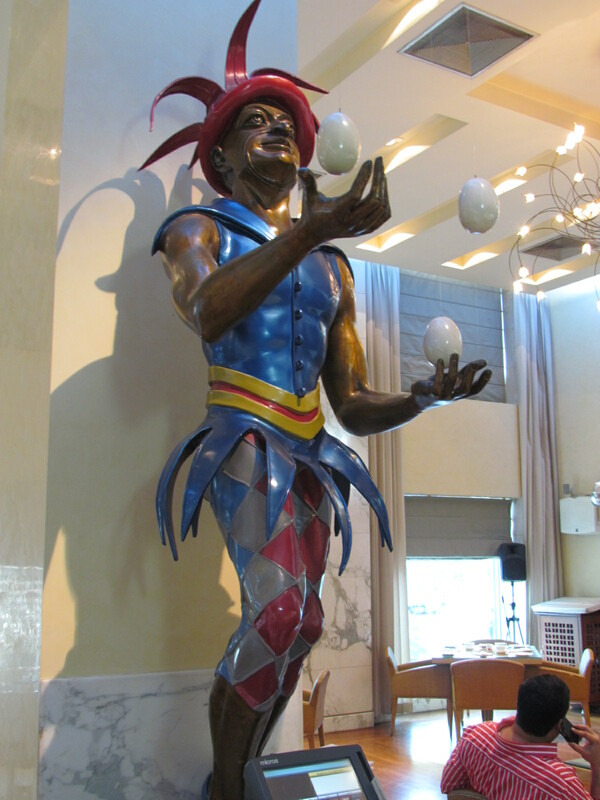 The male is in the act of juggling – eggs!!!!! The kitchen is open & see thru. U can in fact walk up there & have a little chit chat with the chef & his team. We started the breakfast with Eggspectation. It’s a three eggs omelette with mushrooms, onions, Green & Red Bell pepper, bacon, sausage & ham – all in one. This is served with grilled potatoes & some assorted fruits – ‘Chef’s fruit garnish.’ We were served a slice each of watermelon, guava & pineapple. Our expectation for Eggspectation was sky high. So we got a bit dissappointed with the first bite. Like most English breakfast eggs, this egg lacked salt. On sprinkling salt, the omelette sprang back to life. On adding a hint of freshly crushed black pepper, it started talking. The texture was soft & juicy inspite of the eggs beng well done, the taste & flavors of al the ingredients were making their presence felt. 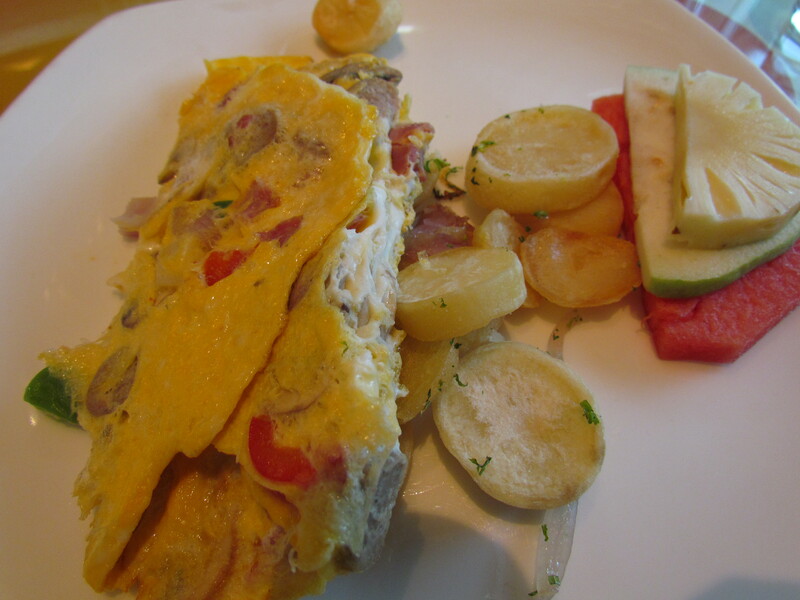 Each bite wud feel different as the ingredients were abruptly distributed across the omelette. I wud not say this is a marvel of a dish. I am sure ANONYMOUS can make it as good at home. Its surely not bad. Rather I wud say it is quite good. Give it a sure try if u do not cook omelettes urself or have not tried beyond the usual ‘onion & green chilli slices’ omelette at home. 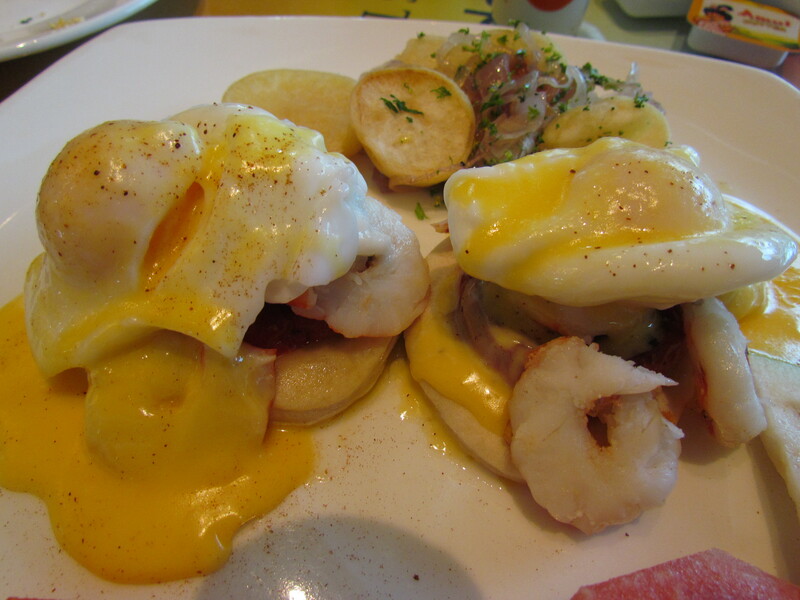 Post eggspectation we tried Shrimp benedict – It had a base of grilled flat bread that was very soft & good to taste, a layer of bacon & poached eggs on the top. The eggs I must say were a marvel – not too hard, not runny , just perfect. Smoked shrimp was put all around as garnish. Loved the dill Hollandaise sauce that was poured all over. Roasted tomatoes & an excellent herb sprinkled sauteed onions were served on the sides. Liked this dish but realized at the end that the shrimps that feature in the name of the dish really did not add value to the dish. U will enjoy the dish as it is if u do not think on these lines. Third in row was California Benedict. This Benedict had a wheat bread base that was crispy toasted. On top was smoked salmon, two perfectly poached eggs, gruyere cheese & spinach. Asparagus sticks that were served on the side looked quite fat & overgrown but turned out to be good in taste. 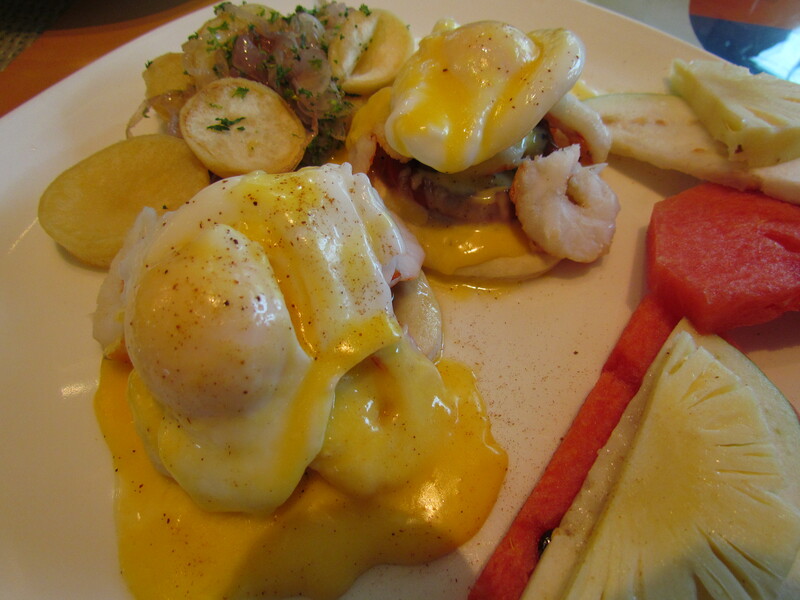 Classic Hollandaise sauce was the magic element for this Benedict. Loved the tase. Found it to be better than the shrimp version. 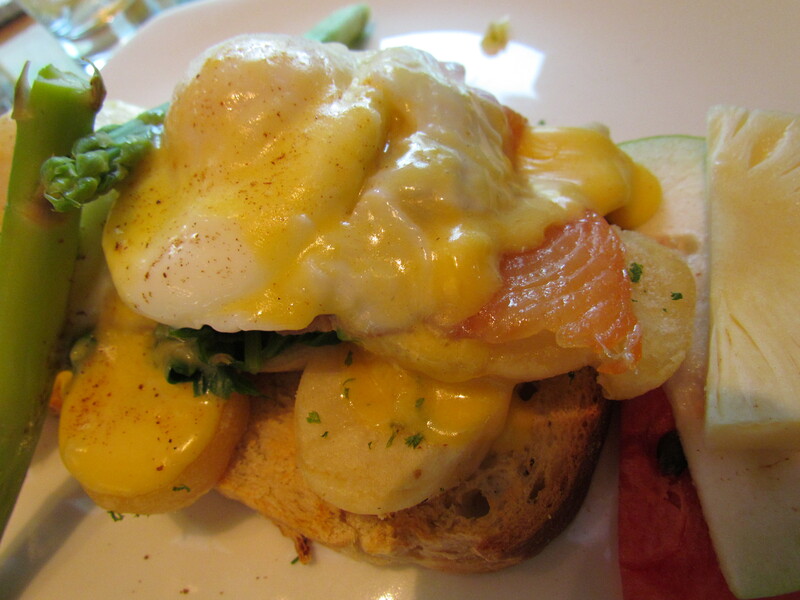 They also serve Florentine Benedict & Country French benedict. Look forward to trying them out on another occasion. Post this we had some coffee. One was a ice cream coffee. 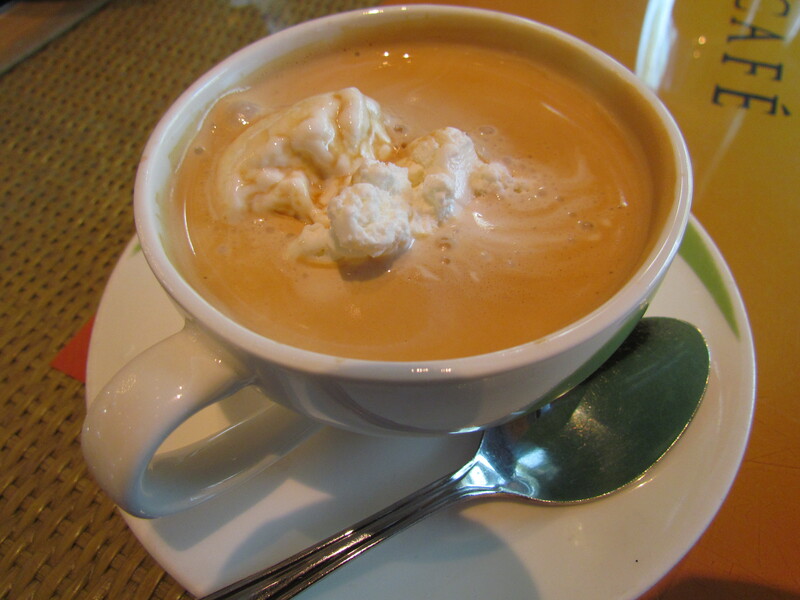 A dollop of good vanilla ice cream in a cup of pure black coffee. I had no idea it wud taste so good. 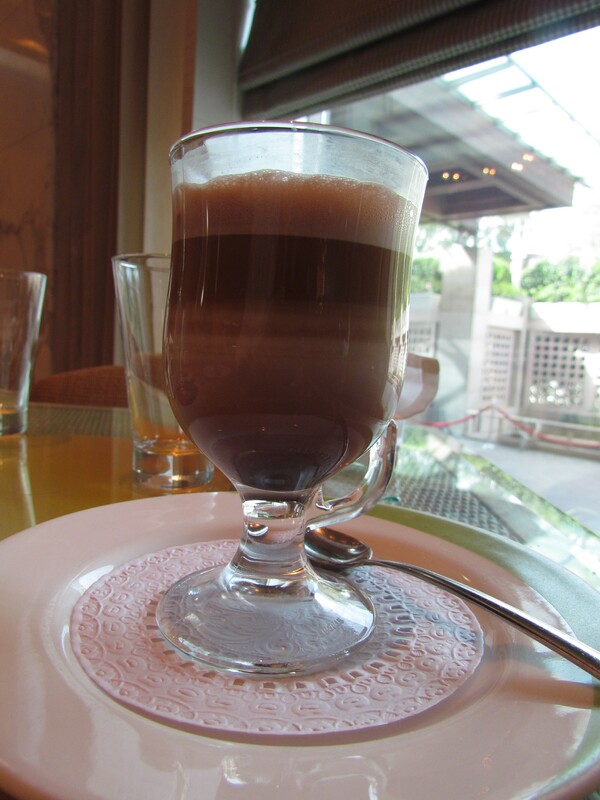 The other coffee that we tried was a chocolate coffee in wich we cud see different layers of browns. Tasted good but not great. After a bit of rest & coffee the breakfast continued. This time came crepes in South American style. 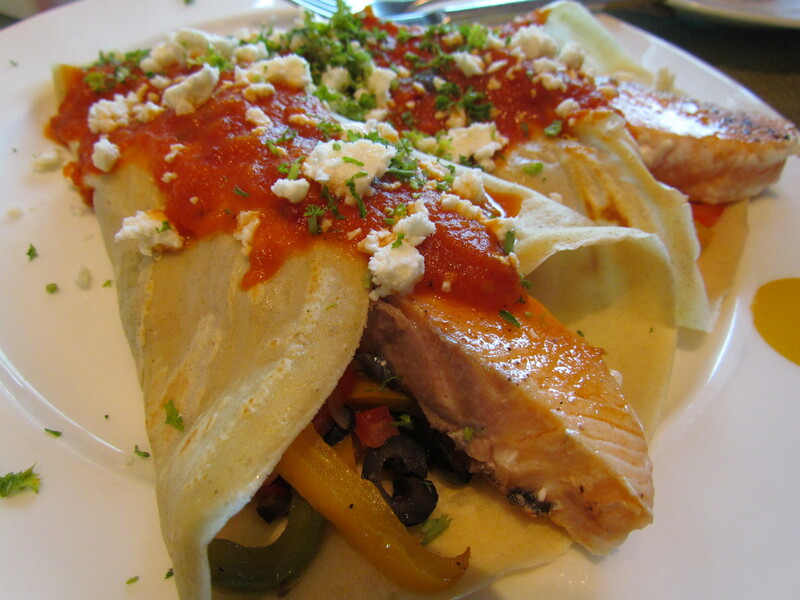 Grilled salmon steaks inside crepe wraps, along with some wow ‘sauteed bell peppers & onions’. This was topped with a inhouse made tomato sauce that was not smooth like a ketchup & did not taste tomatoee as well. Cheese & herbs sprinkled on top added to the flavors & the aftertaste. The salmon was outstanding – the fish itself & the way it was made. The crepes were soft & nice. Cool. Really good & wud again have this dish next time. 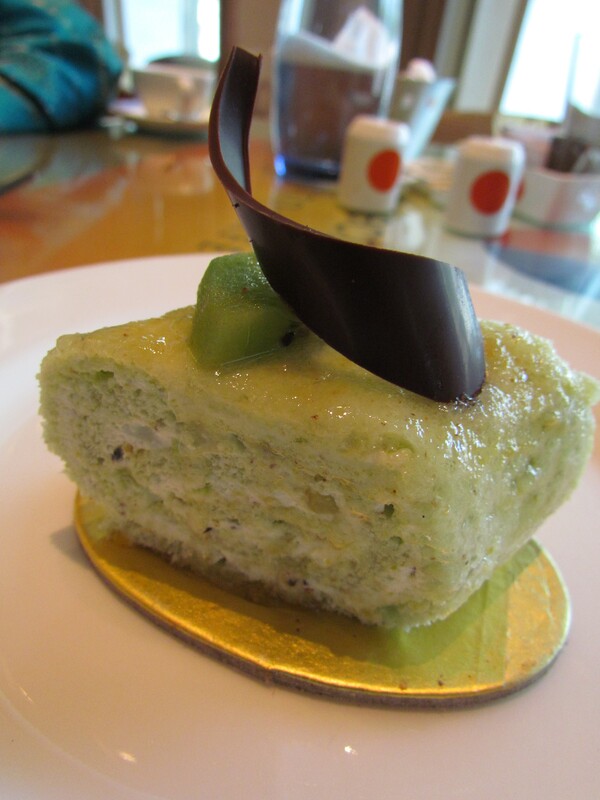 For desserts came a kiwi cake which one of my co diners freaked out on. It was very good & different from the usual cakes that one gets. It was refrigerated & I have a feeling that it wud b better to taste if eaten after it is kept in room temperature for 15 minutes. Cherry pie was another excellent dish here. 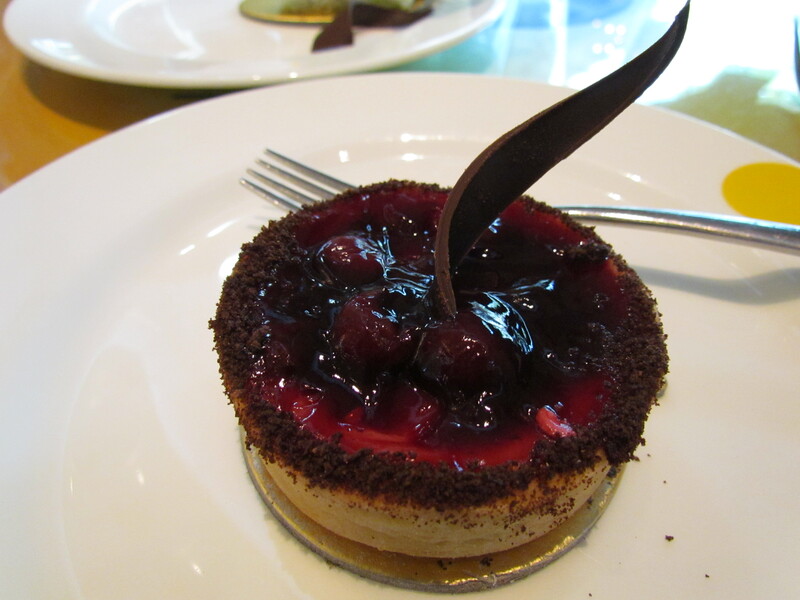 A flaky crispy pie base with a filling of real cherreis in cherry sauce & topped with choco powder. Sinfully good & enjoyable. 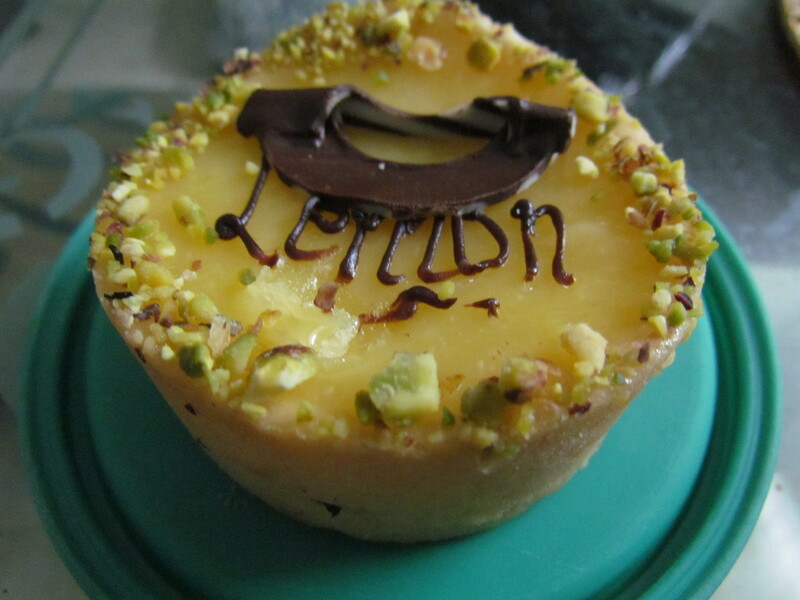 Got lemon tart & apple pie packed for home. They turned out to be very good too. Look forward to revisiting & trying out more dishes. Will keep u updated. Only eggs? Wow! I’ll go crazelet! Very very nice post – love the pictures. Only the aroma is missing! Great to know u liked the post. Awesome Review….I think you should add the prices of the dishes you taste or recommend. Thanks for ur suggestion & great to hear that u liked it. My thought on the same – Prices keep changing from time to time. So I usually provide a link to the company websitewhere u can see the latest menu card. Hi Krunal, for Eggs Benedict one or two slices of bacon on a atosted English muffin topped with a poached egg and then drizzeled in Hollandaise sauce garnish for effect. It sounds strange but it’s quite delicious. If you don’t fancy bacon you can replace it with spinach and you get what’s called Eggs Florentine (also delicious.) Have fun in the kitchen! This looks absolutely deiiclous. I once watched a film about the secrets of food photographers and many of their tricks to make the food look better and last longer were products you’d not want to consume. In the case of Eggs Benedict I’d have to make some for photographing and some for eating. I’ve always considered this dish a special treat for a special occasion/morning. Wonderful job, Martina!